To start apartments are great for those: living in a large city, do not need a lot of living space, trying to save money, fresh out of college/currently in college, or really a multitude of reasons. From my experience, currently I live in an apartment complex and have some strong opinions on the positives and negatives of apartment living. First, it’s a great place to start when you don’t need a ton of space but want to get out on your own. My apartment has everything I need in it and was even tough for me to fill the mere 700 square foot place! I also love the amenities! I think it is awesome to have gym on site. After work I can just walk right over to the gym to get a workout in without having to leave the complex. Now… in my situation there are a few things with apartment living that I could do without. Personally, I don’t like having neighbors all around (but obviously that’s what comes with living in an apartment) and it can often be noisy. The place where I live made it look super nice on the initial tour but skipped over some stuff that may have deterred me from living there. Now that I am living here I’ve realized that a lot of the work inside the apartment is poorly done and often breaks. It is stuff like not finishing things correctly or cleaning up paint that spilled in places it shouldn’t be. That’s just a few examples of what I’ve noticed so far living in an apartment. Opt for the easy pre-lit artificial Christmas tree or purchase the real deal? In my opinion I think that the real Christmas tree gives off the holiday vibe. I love going with my family to pick out the perfect tree for our house and then bringing it home and getting it all set up to be decorated. Ohhh and the smell! The fragrance that the real tree brings really ties it all together. There’s nothing like coming home with the house decorated for the holidays and being greeted with the smell of a real Christmas tree! What are your thoughts on real vs. artificial Christmas trees? Though I am all for the real trees I do understand the convenience of having the artificial tree. Let me know your thoughts! With graduation nearing, I am struggling with what to do next. Do I stay at my current job that I kind of enjoy in hopes that I will eventually have the chance to move up in the company or look for a job with a new company? I can’t be the only one with this contemplation right? I like the company I work for now but I don’t really enjoy the work I am currently doing. In my case I will have the opportunity to move up within the next few months but the question I’m asking myself is if I want to stick it out in the hopes that I MIGHT move up. I think overall it’s important to built rapport with the company I am at and just be patient that it will all work out. Any advise from you all would be great! The best things in life are sweet, so why not throw an all dessert party? The trick to that is making sure you start the party a little later and let your guests know that it will be all desserts. That way when they arrive they will have already had a meal and will be ready to indulge into your delicious desserts! In preparation for your party, make desserts that you can freeze a week prior and make the rest the day before the party. The cupcakes pictured above at the party my family threw were made in the weeks prior to the party and kept frozen until they day before. Then we took them out of the freezer, let them thaw out and frosted them so they had the fresh frosting on top. They still tasted fresh and our guests loved them! Having a unique party that was all dessert was a fun way to get family together and enjoy something different! In Toddlers: Bad Behavior or Sensory? You have probably seen a friend or two posting on Facebook with #sensory but what is sensory? Growing hands on kids defines The Sensory Processing System as “basically comprised of the brain, spinal cord, and neurons. It is the neurological wiring by which we perceive and process sensory information coming from outside and even inside our bodies.” (Greutman, 2015) When we talk about sensory for babies, toddlers, or children we are usually talking about an activity. “A sensory activity is anything that involves the 5 senses (taste, touch, smell, hearing, sight)” (Greutman, 2015). These activities can be nearly anything as long as they involve one or more of the 5 senses. They can be messy, fun and can keep even the busiest babies attention. Where is the line between sensory and behavior? My one year old pictured here gets her hands on everything! The cover photo captures her with an item found in her brother’s room; it was shredded paper from a gift. My husband gets upset with her and wants to take everything away right away. But I look at it as sensory! You can see her mind working about the texture, color, sometimes taste, smell or sound. He sees bad behavior and I see sensory. She was very into a bowl of pomegranate seeds, she ate many, she squeezed them, dropped them in the bowl to hear the sound, she took them out and lined them up, she popped them and felt the juice run down her hand. So yes it gets messy but is it a child misbehaving or learning? I say learning! These supervised activities and more are just things that kids do but without them they could be deprived of valuable sensory. One of my favorite things to do around the holidays is eat. This is the time of year where I put on a couple of “winter pounds”. Starting on Thanksgiving leading to New Year’s there is an over indulgence of fatty foods and deserts. I myself look forward to my wife making her mac n cheese, stuffing and various desserts. While these foods are delicious, they aren’t the best options to eat. At least if you choose to these options modify the way you prepared them. In order to feel energetic and healthy you have to watch you put in your body. There is a reason after that big plate of food during the holidays your ready for a nap. I would like to share with you some healthier ways to eat during the holiday season. One of my favorite tips is to use low-fat ingredients. This will shave some calories off those fatty foods. You will feel a little less guilty, when you eat that slice of cake. You can also roast or grill your food for fewer calories. This is a much healthier option than deep frying. Another thing to consider is the kind of alcoholic beverages you drink. Around the holidays there is usually an increase in alcohol consumption. Eggnog and other holiday alcoholic beverages have high levels of sugar and calories. If your going to drink alcohol do it in moderation and also mix your drinks with diet soda or sparkling water to avoid the additional calories. Here are some additional ideas for the holidays. Now that the holiday season is upon on us, it is time to remember that many people are going through some tough times. Unfortunately there many individuals and families this holiday season experiencing homelessness without warm clothing and a hot meal and some children will not receive any gifts. This is why if you able to, I would like for you to adopt an idea my wife got from one her friends and that is the 12 days of kindness. It is a play on words from the 12 days of Christmas. For 12 days you and your family can complete one-act of kindness per day. If you have children it is a great way to show them the importance of helping others. You do not have to spend a lot of money to give back. You can give your time. There is a great article listing various organizations that are looking for volunteers in Minneapolis and St Paul. The opportunities range from serving meals to the elderly to locations for toy drop-offs. Another option is to donate your old items. If you have any clothing, books, children toys or any other excess items you can drop them off at a local Salvation Army. I am pretty sure that whatever you are able to do someone will appreciate it. You never know you may be the one needing some assistance someday.This is a great opportunity to end the year doing something special with your family and making an impact in someone’s life. The Knife Media posted an article titled “The follow-up on Matt Lauer’s dismissal: Objection, irrelevant. The author Jens Erik Gould argued that the media’s follow up coverage on Lauer is wrong because it brings up information not related to his current allegations. He is complaining that Matt Lauer reputation is being damaged. He says his past behavior has nothing to do with the current allegations and that it is being used to spin the public. My opinion is that when you admit to inappropriate sexual behavior your past interactions are up for judgment. For anybody that has been living under a rock for the last few weeks, Matt Lauer has been accused of inappropriate sexual behavior with colleagues. There have been multiple women come forward with one accusing him of sexual assault. He was fired from NBC and shortly after he offered an apology to the ladies he hurt. Although he said some of the allegations were false, he admitted that were enough truth in stories to make feel embarrassed and ashamed. He also acknowledged that he caused some pain by his words and actions. This sounds to me like an admission of guilt of some sort, although he did not say which allegations were true or false. Matt Lauer has been on televisions in homes across America for 20 years. After hearing him admit to some level of guilt for inappropriate sexual behavior, I think it is natural for people question past behavior that was overlooked. To many across the country, he is not the man most thought he was. I think there is now context to go along with some of his previous behavior. Everything from the ill advised sexual harassment jokes to taking his pants off on set, I believe it is the viewing public’s right to look back and wonder about the actions of Matt Lauer. This past Saturday our country celebrated Veteran’s Day honoring those who served to protect our rights and freedoms. This is a holiday that goes back almost a century. At the eleventh hour on the eleventh day of the eleventh month, in 1918 the armistice agreement was signed to end the World War I between Allied Forces and Germany. The next year November 11, 1919 President Woodrow Wilson signed a proclamation making this day Armistice Day. It was changed in 1954 by President Eisenhower to Veterans Day. Americans celebrated this weekend by honoring veterans, throwing parades, and other honoring ceremonies. Many restaurants offered free meals to veterans. 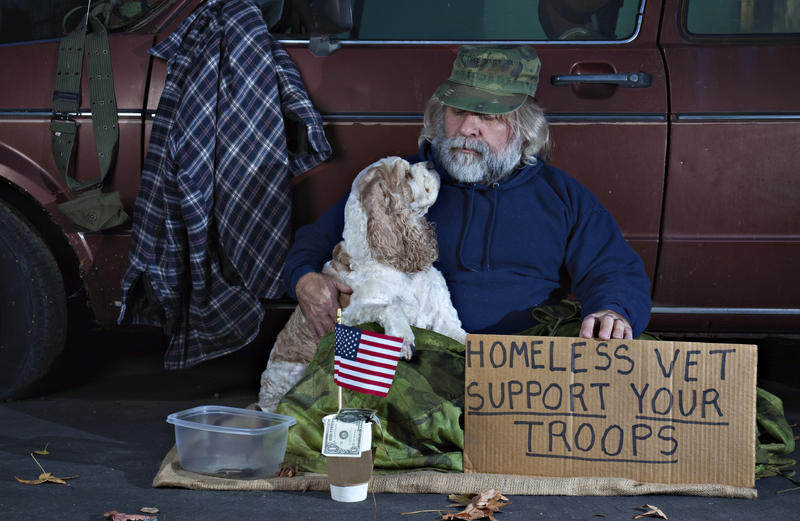 Although Americans show their appreciation on this day, we have a homeless veterans problem in our country. There are many veterans of this great nation without a place to live. I have personally seen many around the Twin Cities holding signs requesting money or food. These men and women have sacrificed their lives and they should not be forgotten. There are veteran programs in place but many veterans are still not taken care of. Many of these veterans have experienced combat and suffer from Post Traumatic Stress Disorder. Some veterans are finding it hard to transitioning their military skills to civilian life. As a veteran myself, it hurts me to see my fellow service members struggling and staying on the streets. Many veterans are unaware of the type programs and benefits they are qualified for through the federal Department of Veteran Affairs and Minnesota Department of Veteran Affairs. If you happen to know or see a homeless veteran, refer them to the both these state and federal Veterans Affairs. Let’s end veteran homelessness.